This video screengrab shows a conceptional rendering of the U2C autonomous vehicles that are planned to replace the existing Skyway. The Jacksonville Transportation Authority is continuing its push into the world of autonomous vehicles with a new alliance. JTA's shows off one of it's driverless EV test vehicles. JTA is joining forces with Florida Polytechnic University’s Advanced Mobility Institute, which focuses on advancing and testing driverless transportation. The mutual agreement includes fostering the development of AV technology in downtown areas, university campuses and other controlled settings. That in turn dovetails with JTA’s plan to modernize and expand the Skyway with autonomous electric vehicles that would run on existing elevated Skway tracks as well as on street level, expanding the system to the sports complex, Riverside, San Marco and Springfield. JTA tested this autonomous electric vehicle in June. 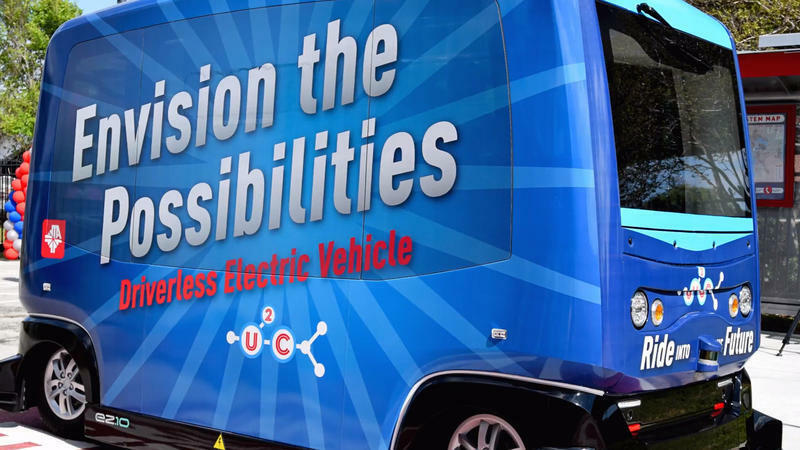 JTA is calling the Skyway modernization project the U2C, which stands for Ultimate Urban Circulator. The U2C ties into a larger project with several agencies to turn Bay Street in downtown Jacksonville into an "innovation corridor." It would bring together a series of cameras, sensors and autonomous vehicles to improve traffic flow and improve safety. JTA and other local agencies are pursuing a $25 federal million grant to help turn the program into a reality. As part of the project, JTA has been testing driverless EVs on a test track it built that runs next to Metropolitan Park near Bay Street. Called the AV Test & Learn Track, JTA has also on occasion offered test rides to the public to show off the potential of driverless vehicles. JTA has also announced another testing phase that will convert a portion of the existing Skyway between Jefferson Street station and its under construction transportation center as an elevated test track for autonomous vehicles. “We’re excited to collaborate with the Jacksonville Transportation Authority, sharing with them our scientific research and expertise on autonomous vehicle technology,” said Florida Poly President Randy Avent in an email to WJCT News. Santa has figured out a way to spend some time in Jacksonville in between getting ready for his big Christmas Eve trek around the world. Several local agencies are trying to get a $25 million dollar grant from the U.S. Department of Transportation to help fund what’s been dubbed the Bay Street Innovation Corridor in Jacksonville. A D.C.-based think tank has some suggestions for how the Jacksonville Transportation Authority’s planned Skyway replacement can be successful, according to a presentation Friday. But they’re not the kind of tweaks you can make overnight. Bike share could be coming to downtown Jacksonville. This coming Tuesday, Nov. 20, the Jacksonville Transportation Authority is expected to hear pitches from four operators who want to roll into town.